Welcome to Saturn Valley is an Event Course in Super Mario Maker based off of EarthBound, released on December 18, 2015. It unlocks the Mr. Saturn Mystery Mushroom costume upon completion. 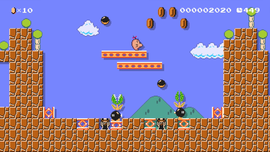 The level begins with a house-like structure, with a warp pipe leading underground to a Mystery Mushroom. After exiting from the same warp pipe, Mario must head right and avoid the Bob-ombs with Piranha Plants, then enter another warp pipe and climb across the beanstalks while avoiding Bull's-Eye Bills. Another warp pipe appears, along with a conveyor belt section with Goombas, Buzzy Beetles, and Spinies, with the Goal Pole at the end. This is Saturn Valley. The Mr. Saturns live happily here, along with many unusual creations. Try searching for the Mr. Saturns hiding all over the place–in houses, caves, and more! If you reach the goal as Mr. Saturn, you'll have good luck all day long! ...Probably. This page was last edited on February 7, 2018, at 14:35.